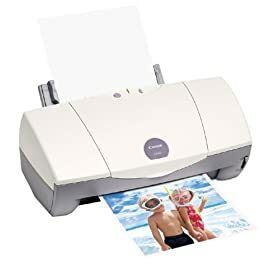 My very first inkjet printer I bought was an Epson about 10 years ago. The reason for choosing that brand was its fame for photo-quality printouts. However, that printer did not last over 2 years because the print head clogged beyond repair. For my replacement printer, I still chose Epson, because the quality is indeed the best among the competition. But again the print head didn’t survive the toxic ink and started clogging yet again. It didn’t help when the ink cartridges were costly and that each cartridge contains 3 independent colour chambers, which means if one colour finishes, I have to replace the entire cartridge. b. the print head module is removable and you can use other types of print heads like a 6-colour module or a image scanner module. And the fact that it’s removable means that in the event the head is clogged, I can buy a new print head module instead of throwing the entire printer. Now, after over 8 years (I think! ), the printer still works, amazingly. First, the print head did not clog. Second, the ink did not harden (maybe because my printer is kept in a cool humid place). I probably switch on the printer once every 3 months to do a few pages of casual printing. The ultimate incident is this: when the ink ran out last week, I was surprised that I can even find the replacement cartridges at my neighbourhood bookstore! It can’t get any better than this! No other electronic equipment I know of that I own has their replacement part or accessory still available in retail stores after so many years. I can’t say whether the new Canon printers have such long lifespan, but one thing is for sure: you are never wrong in choosing original brand ink cartridges. I am a living proof that using original cartridges can extend your printer’s lifespan beyond your wildest dream. Many people might think that it’s not a big deal since printers are so cheap. I don’t mind getting new and latest technology printers if I am a fervent print-out user. But I only print stuffs once in a blue moon. It’ll be an absolute waste to buy a new printer to print less than 50 pages only to find that the machine no longer works because of a clogged print head. I’m just thankful to own a hardy printer that served its purpose in times of occasional use.